Our love affair with Cupcakes a GoGo started about three months ago when we attended our First Friday in Venice event. For those of you that donât know what that is, on the first Friday of every month, all the stores located on Abbot Kinney stay open late and a bunch of food trucks park along it to sell their gourmet wares. 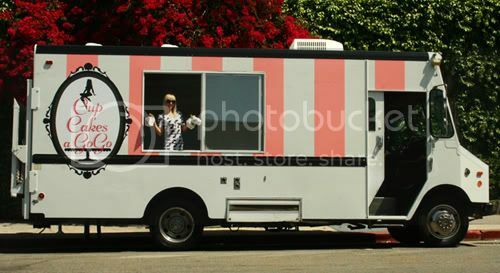 As we were strolling along the street taking in all the gastronomic possibilities, we saw a bright white truck with pink vertical stripes with a cupcake in a black, French baroque frame painted on the side. Let me tell you, it caught my attention. When we approached the truck, we were greeted by a huge display of cupcakes. They are individually packaged in white Chinese take-out containers, with the Cupcakes a GoGo label on the side, tied with different colored ribbons to help tell the cupcakes flavors apart. The inside of the truck is padded with black tufted vinyl and pink buttons. Visions of a vintage soda shop come to mind. And keeping with the theme, the owner was decked out in a 1940s or 1950s dress, bright red lipstick and a flower in her hair. I decided to try the strawberry cupcake. It is a light strawberry cake topped with a strawberry puree cream cheese frosting. The cupcake was moist and I was greeted with the fragrance of sweet strawberries. But itâs the frosting that takes the cake for me. The frosting is super smooth and isnât too sweet. The flavor was just like strawberries and cream. Many bakeries put too much powdered sugar in their cream cheese frosting, which gets hard and dry when exposed to air and often overpowers the flavor of the cake. Cupcakes a GoGo has perfected their cream cheese frosting and expertly proportioned their cake to frosting ratio. My husband, Jason ordered the Cookies and Cream cupcake. It was a chocolate cupcake with Oreo cookie pieces folded into the frosting and topped with an Oreo cookie. Even using a butter cream frosting, Cupcakes a GoGo, was able to make this rich frosting with an airiness that allows you to consume the delicious morsel without guilt or fear of cardiac arrest. We have been back to First Friday in Venice for three consecutive months and each time I eagerly await the chance to try another cupcake flavor. We have since sampled their Banana Peanut Butter, Mint Chocolate Chip and Red Velvet. Each as good as the last. Â We have yet to try one that we didnât like. I know that cupcake bakeries seem to be coming out of the woodwork, all hoping to capitalize on the success of Candace Nelsonâs Sprinkles chain but donât be fooled, not all cupcakes are made the same. I encourage you to visit Cupcakes a GoGo for their light, refreshing approach to cupcakes, or just maybe, theyâll be rolling up to a curb near you. And YES, they should compete on next season’s Cupcake Wars! I do agree with you 100%. The truck is very appealing and they have an original take on presentation. I have only tried the Peanut Butter & Banana cupcake which was very good, and I am looking forward to trying some other flavors. Love your photos.